I spent the Summer of 1970 in Little Rock working as an intern at the Personnel Division of the Arkansas Department of Finance and Administration. This division was a lousy place to hang out, but I learned about organizational dysfunction and how jaded employees can torpedo a weak manager. Also, I learned and wrote quite a bit about public employee unions, a topic of absolutely no interest to state policy makers. Whatever the deficiencies of the internship, completing it was one of the requirements of the University of Arkansas Master of Public Administration (MPA) program and the pay was not bad. 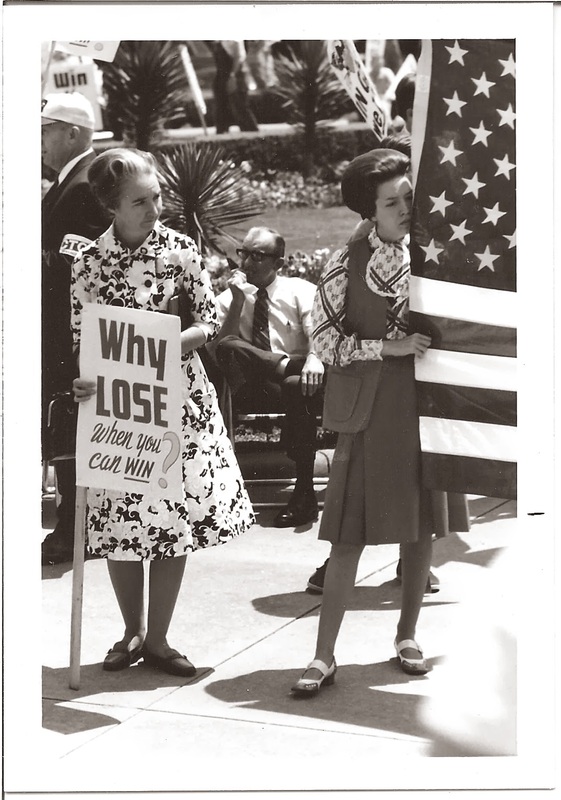 Because I was doing this internship, I was in Little Rock when a pro-war, anti-Fulbright march was held on Saturday, June 6, 1970 in front of the state capitol. I was curious about what would happen and who would attend. Also, my 35 mm Yashika camera had just been fixed, and I had a telephoto lens that I wanted to test. So, I showed up for the march and took a bunch of pictures. 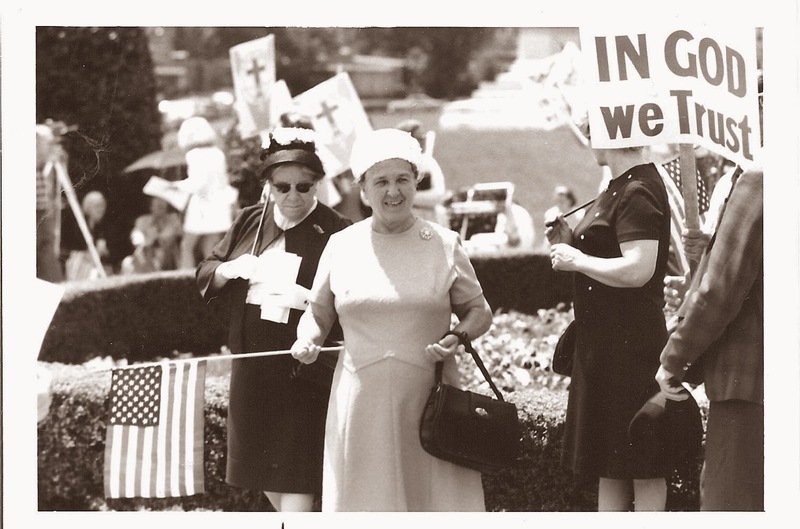 When I recently ran across some of these pictures, I could not remember much about the march, so I looked up the Arkansas Gazette story reporting it. It was written by Ernie Dumas and was front-page center, with several pictures. Reading it reminded me of what a fabulous reporter Dumas was. In the first three paragraphs, he made it clear that not very many people showed up for the rally, half of those there came from outside Arkansas, and Rev. Carl McIntire -- who was leading the march -- was a liar ("McIntire told his radio audience...that it appeared that the crowd would be the largest ever assembled at the Arkansas Capitol.") Then, he painted short, colorful word pictures of various people at the march. The story is a delight to read. 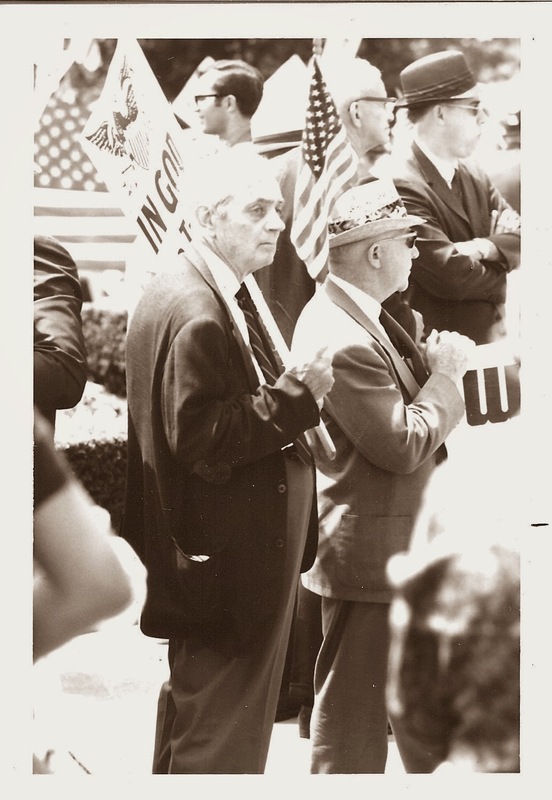 This march was one several pro-war marches held in 1970 by McIntire (1906 - 2002), a fundamentalist minister who had been expelled from the Presbyterian Church in 1936 and had been minister of the Bible Presbyterian Church in Collingwood N.J. since 1937 (two good sources that provide information about his life and career are: http://en.wikipedia.org/wiki/Carl_McIntire and http://www.carlmcintire.org/ ). One of the causes promoted by the march was the collection of signatures for a vote on a state constitutional amendment authorizing recall of Senators and Congressmen in Arkansas. The measure was aimed at Sen. J.W. Fulbright, and the signature drive was headed by Jim Johnson, who had challenged Fulbright in the 1968 Democratic primary, but had lost. A few days after the march, Johnson announced that he had not collected enough signatures to get his measure on the state ballot. Below is a long excerpt from the Dumas' story about the march, plus some of the pictures that I took of it. June 7, 1970, p. 1A, 2A, and 4A. 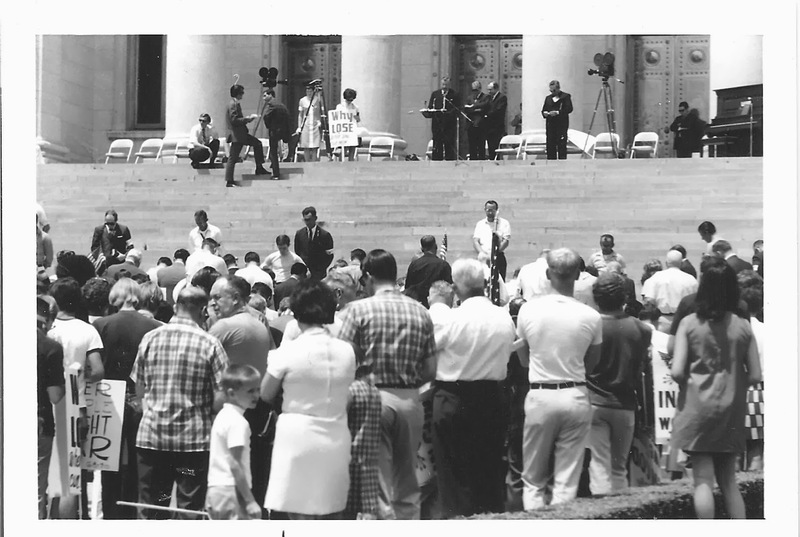 Men and women plastered with stickers and waving signs and flags marched three blocks down Capitol Avenue and back and then stood in the sun or under a magnolia tree on the Capitol lawn for three hours of speaking, singing and praying. 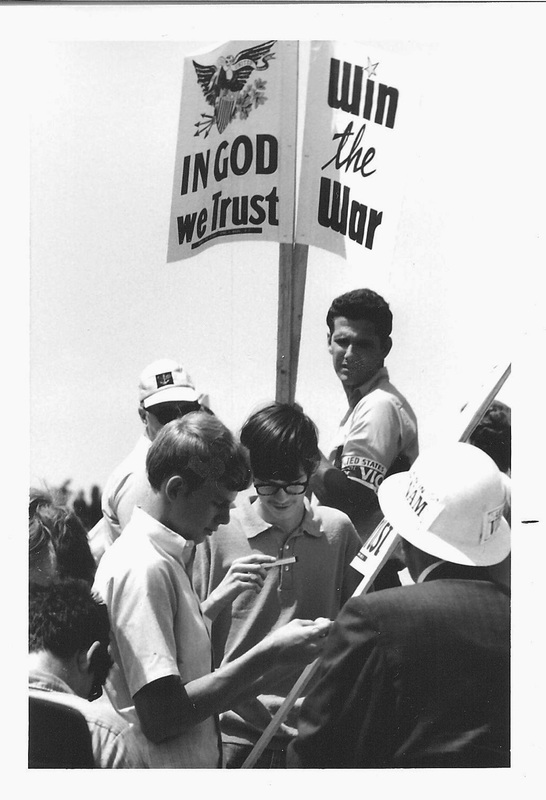 They came for the “March for Victory in Vietnam,” which was organized by Rev. Carl McIntire of Collingwood, N.J., a radio evangelist. The crowd obviously was below the leaders expectations. 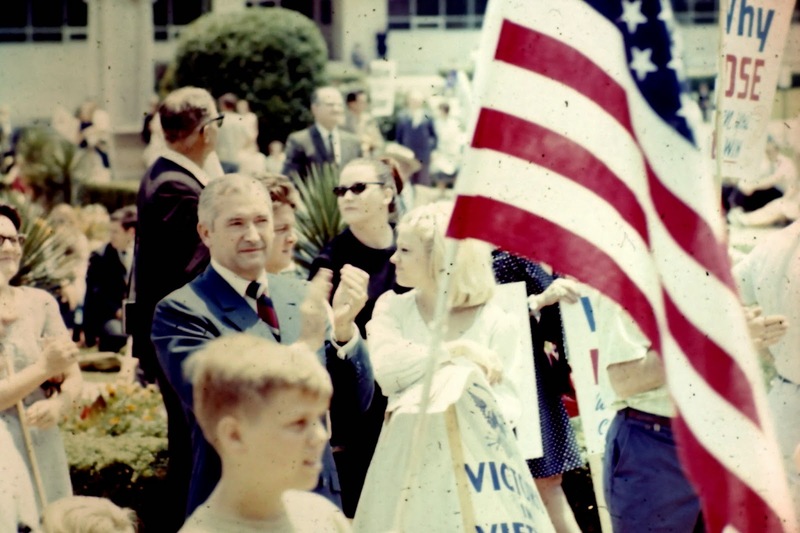 McIntire told his radio audience from a telephone in the Arkansas Education Association Building a few minutes before the march began that it appeared that the crowd would be the largest ever assembled at the Arkansas Capitol. 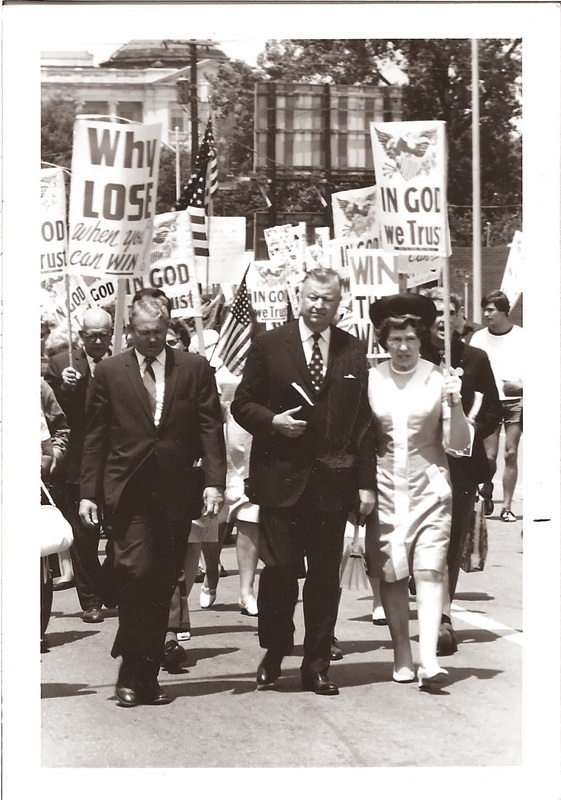 McIntire and Rev. 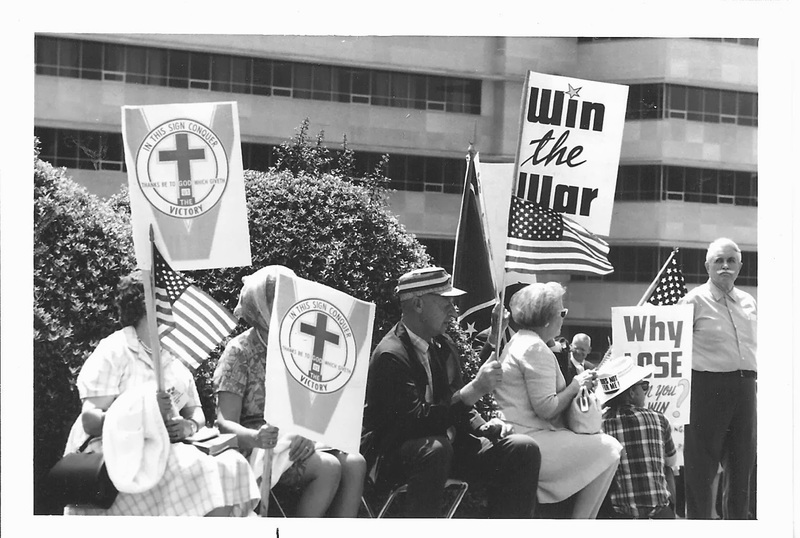 M. L. Moser Jr of Little Rock, pastor of Central Baptist Church, had said the march was organized to show the world that Arkansas people repudiated Fulbright’s stand against the expanding war in Southeast Asia. Fulbright came under wrathful attacks from the ministers. “He is now the chief Communist spokesman in the United States,” Moser shouted. “He has joined forces with the enemies of the United States. Moser prefaced this by saying that he did not hate the senator. Jim Johnson …told the crowd that it was probably more difficult to obtain a crowd in Arkansas than in any state. However, he said, for every Arkansan at the rally, 100 persons back at home were with them in their hearts. A dozen or so young persons carrying signs calling for peace mingled in the crowd. Little clusters of sign waving supporters of the war gathered around them to shield the peace signs from view. The noise from taunts or arguments with the peace supporters at times competed with the loud speakers on the steps. “Filth, filth, filth,” chanted a heavy man in a black suit, who identified himself as Rev. W. L. Smith of Perry, FLA., a primitive Baptist minister. Gary Woods, who edits a peace newspaper at Little Rock, sat quietly on the balustrade near the speakers wearing a floppy little hat. He said he was surprised at the crowd. More people show up at local peace rallies, he said. 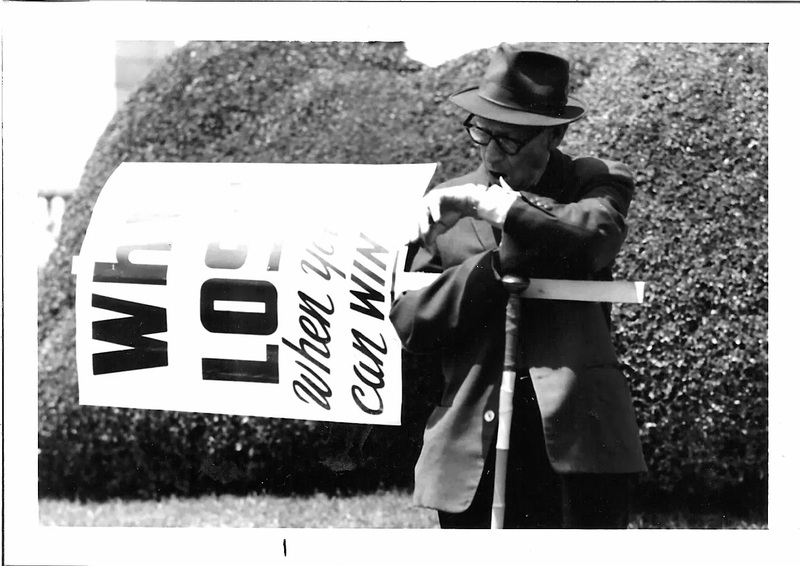 McIntire had brought 2,500 signs with him, but not all of them were used. He told his radio audience in a broadcast before noon that the march effort had to overcome opposition from the two Little Rock newspapers. The people here are certainly conditioned – you might even say brainwashed,” he said. Arkansas has the plague of a Fulbright and a controlled press,” he declared. 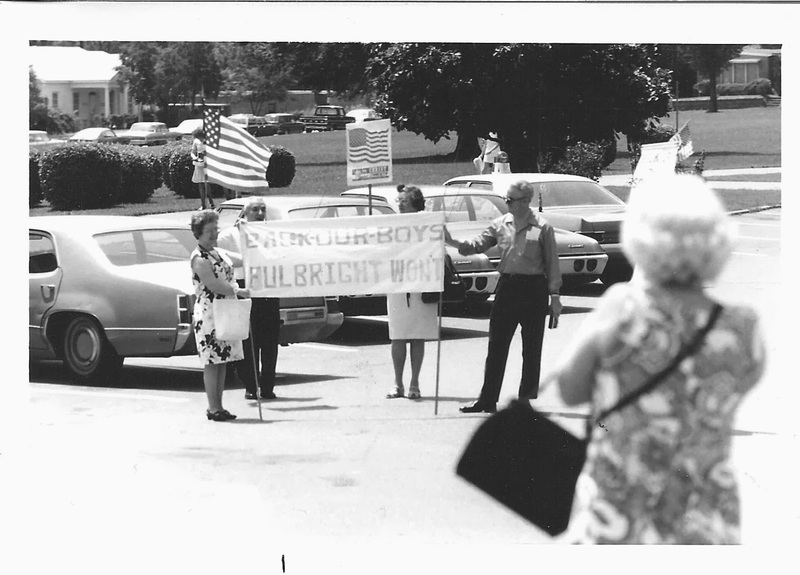 Banner says, "Back Our Boys, Fulbright Won't"
Elderly men and women were in abundance, carrying flags, signs and Bibles. One woman was dressed in clothing resembling an American flag and carried a huge sign that was in the shape of a liberty bell. Nguyen Hoan, representing the South Vietnamese Embassy at Washington, read a statement in which he said the war was essentially a Vietnamese war but that his people welcomed Americans because “there is no room for another Munich in Asia.” He did not mention Fulbright. What's a pro-war rally without a Confederate battle flag? A youth who identified himself as Mike Sparr, 17, of North Little Rock, state vice-president of the Young Arkansas Conservatives and a companion with long hair, burned a red flag, which Sparr said represented the Viet Cong flag, on the Capitol steps. Sparr’s companion was grabbed briefly by a man who stamped out the fire and called the two hippies. Midway in the rally, McIntire’s aides circulated through the crowd taking collection in little buckets. McIntire urged the people to give whatever they had with them or write a check. “We spent a lot of money in here believing that you people would make it possible and give use a very fine offering,” McIntire said. "IN THIS SIGN CONQUER, VICTORY"
"American Sold Out by Brother Bill"